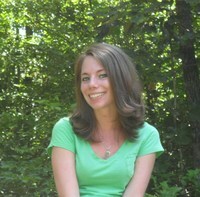 I live in a small town nestled in the mountains of Western North Carolina with my husband and two small children. Growing up, I was always an avid reader. My mother spent way too much money on R. L. Stine and Christopher Pike books! Writing a novel of my own wasn't something I'd ever given much thought to. It seemed like an unobtainable, far-fetched dream. Then, in late 2007, I attempted to put pen to paper for the first time. What came out wasn't pure gold. And what came out next wasn't either. Things didn't work that way for me. I had to write and rewrite and learn more about my 'voice' as an author first. It took me a while to find that. Roughly about two years. I did make a stab at going the traditional route to getting a novel of mine published, but it didn't work out. Some might say I gave up too quickly, some might not. You can look on the 'For Writers' tab to read my post on why I went the way I did to hear the full story. I will say, I don't regret my decision to Self-Publish. It was right for me. I'm loving that fact that I am able to still be a stay-at-home-mom even though my kids are both now in elementary school. I thank my readers for that. Seriously, a million times over I thank you! Pain and despair are things many experience in their lives but when the ones suffering are kids, it is even more heartbreaking to read about. The Unloved features a girl and boy, both have been victims of dysfunctional families for all of their young lives. Jules has a stripper for a mother, a pill-popping, promiscuous woman too selfish for words. Cole's father is an alcoholic abuser, smacking his wife around and bullying his son. Cole gets a break when he is sent to live with a relative for two years. Every day he's away his thoughts always go back to his best friend, Jules, and what she may be enduring. The story begins when he returns home to live, taller, smarter and a lot more buff. True friendship is at the heart of The Unloved, a poignant, heartbreaking read. One can't help sympathize with Jules and Cole, two friends who've endured an incredible amount and have both developed deep feelings for each other. Jennifer Snyder captures the essence of both characters, showing us the true teens they are and the faces they put on for others. They live with the labels of trailer trash and are candid in their acceptance of such a label. Cole loves Jules but she can't bare to give her entire self to him in fear of being hurt. Her frank admission was touching. These kids are wiser than sixteen and carry an entire lifetime of heartbreak. There were occasions where either character seemed to tell too much of themselves instead of showing us in another way. For a story about abuse and pain, there was still enough hope, love and understanding to give it complexity and light. Jules has a nice group of friends and Cole makes friends with Emily's boyfriend and his group. 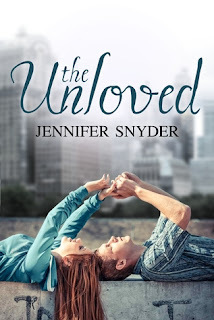 The Unloved touched me with its honest depiction of two teens faced with the impossible and with love can look forward to a better, more optimistic future, if they let each other in. Sweet. Having that white shed somewhere would have made it a perfect cover. One eBook copy of The Unloved through Amazon or B&N, open Internationally.